Nirit Takele, born in Ethiopia in 1985, immigrated to Israel in 1991 in “Operation Solomon” an Israeli military operation that transported more than 14,000 Ethiopian Jews to Israel in 36 hours. Although she grew up with very few memories of her childhood in Ethiopia, Nirit has been painting from a very young age practising her skills by studying the works of artists like Peter Paul Rubens, Diego Riviera and David Hockney. In 2015, Takele graduated with honours from Shenkar College, receiving The Talia Sidi Prize. Nirit is a bold colourist, building up faceted figurative bodies through the application of near abstract flat forms. With a sharp understanding of the power adjacent colours impart upon one another, her figures pop from the canvas, with vivid dimensionality. 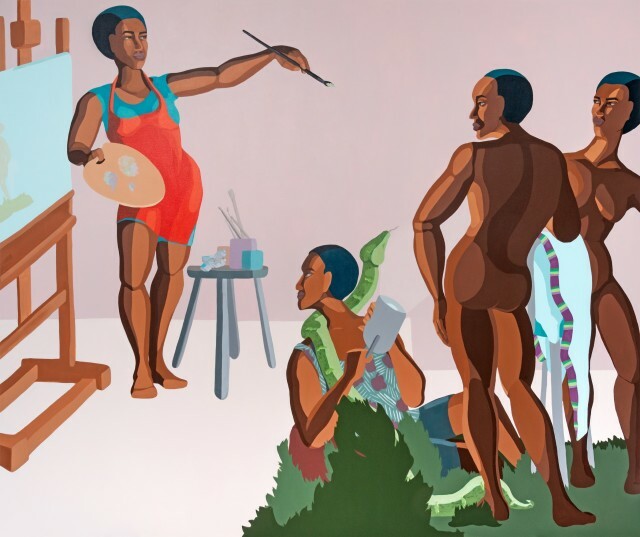 She explores her cultural heritage in her works, illustrating the everyday life of the Israeli Ethiopian community and finding inspiration in old Ethiopian sagas and folk tales remembered from her youth. In collaboration with Serge Trioche’s Israeli art incubator Start Residency Program, Addis Fine Art hosted Nirit for a two-month residency in Addis Ababa. Her renewed encounter with the reality of her birth place has led Nirit to produce some of her most remarkable works. Inspired by the colours around her, she adopted a much brighter palette giving the exuberantly colourful works an enhanced vividness and depth.